It’s not easy to qualify for the World Surf League’s Championship Tour. It’s estimated that there is somewhere in the neighborhood of 23 million surfers on the planet; out of that, a grand total of 32 will qualify for a full-time spot on the Championship Tour. Consider that a kid coming out of high school with NBA dreams has about a 0.03 percent chance of playing pro ball. But in pro surfing, the chance that one will qualify for the tour plummets to a measly 0.0000014 percent. The side-by-side comparison illuminates two points: First, kids, stay in school. Second, when surfers in our community do join the elite ranks of the WSL Championship Tour, it deserves to be heralded for the nearly impossible accomplishment that it is. Of all the local boys, Tanner Gudauskas stands the best chance at qualifying for the Championship Tour. Currently ranked 19th on the Qualifying Series, he needs to finish ninth or better. “For me, it has been a personal goal to requalify onto the Tour since falling off in 2010, but it has taken me a long time to actually face the challenge head on and give it my 100 percent effort,” said Tanner. There’s an outside chance that Tanner could be joined on tour by older brother, Pat, who needs to finish second or better at Sunset to qualify. Sitting 30th in the Qualifying Series rankings, he has considerably more work to do if he wants to rejoin the tour. But after spending a few years on tour, he knows what it takes to get the job done. 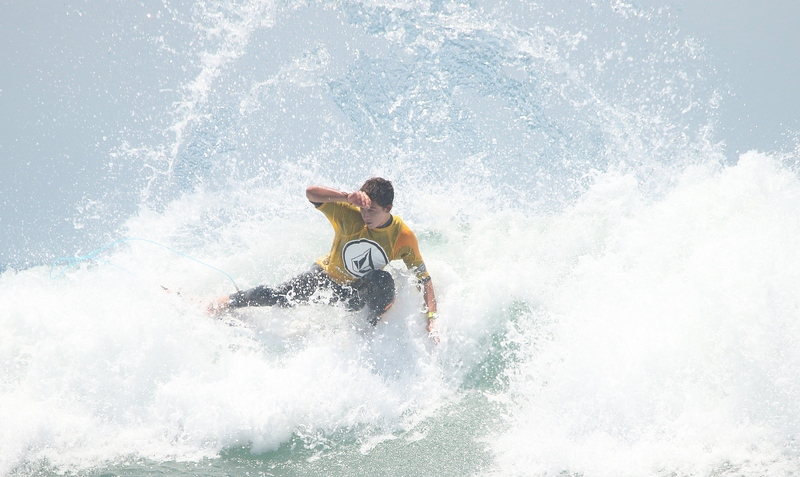 A surprise name in the qualification conversation has been 18-year-old Griffin Colapinto. Coming off a statement-making third place finish at a contest in Brazil, he kept the pedal to the metal at the recent Hawaiian Pro, where he made an unexpected quarterfinal appearance, earning himself an equal ninth place result. Griffin is currently ranked 26th on the Qualifying Series and needs a fourth place finish or better at Sunset to graduate. In the last few years, San Clemente has become a preferred haunt for world tour surfers looking to relocate. Thanks to its proximity to Lower Trestles, the Orange County-based surf industry and the Los Angeles International Airport, it’s an ideal jumping off point. As such, there are a couple transplants worth keeping an eye on. Last winter, 23-year-old Evan Geiselman, who originally hails from Florida but has a residence in San Clemente, almost drowned while surfing Pipeline. This year, he came back with a renewed sense of purpose and now only needs to finish 17th at Sunset to join the Championship Tour. If he makes it, it will be one of the most inspiring stories in surfing in recent times. Another one to watch is Keanu Asing. Born and raised in Hawaii, he spends the offseason in San Clemente training with his girlfriend, who’s an MMA fighter. Asing’s already on the Championship Tour and could “double qualify” if he wins Sunset. There’s still a lot of surfing left and anything can happen at Sunset, but with a little luck, San Clemente will have some hometown heroes to cheer for next year on the WSL Championship Tour.